Directors – Francis Small Heritage Trust, Inc. The Francis Small Heritage Trust is managed by an unpaid board of directors. Each director serves for a term of three years. Directors and officers are elected at the Trust’s annual meeting in October or November of each year. Any of the directors may be reached by contacting the Trust. The Trust is especially grateful to the two founding directors whose vision made the Trust a reality. Sherwood and Lorraine Libby worked as a team on many environmental fronts, and the Francis Small Heritage Trust would never have existed without their dedicated work. Sherwood Libby was recognized by the State of Maine as a Leading Maine Environmentalist after his death on October 14, 2009. J. Lorraine Libby served the Trust until her death on November 6, 2011. 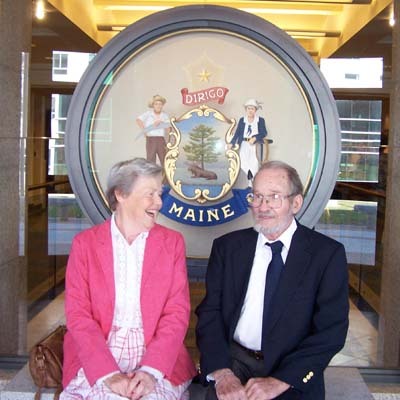 Both Lorraine and Sherwood were honored by Maine Governor John Baldacci and the Maine State Legislature for their lifetime of dedicated work for the people of Maine on April 26, 2007.